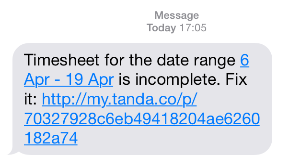 If staff forget to clock-in and out, instead of chasing them up, you can send out a reminder from Tanda for them to fill in their times themselves. This can be automated through Scheduled Tasks and manually done on the Timesheet itself. By default, new accounts will have the Incomplete Timesheets Reminders - Weekly already enabled. This will send an Email to staff with incomplete times, on the day after the pay period finishes at 7am. To set it to send on a daily basis for the day before, select this option and click on Enable. To disable either, once it's enabled, the option changes to disable.